Synchroflex Timing Belts consist of 2 components, the wear resistant contilan, a polyurethane, and a high grade steel cord tension member. The excellent bond between the two materials results in high power transmission capacity. 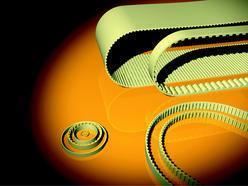 The cast polyurethane timing belt is a precise image of its shape. A high pitch accuracy is reached for the whole belt. For this reason, it is particularly suitable for angular accuracy, smooth running and high rotational speeds. Low length tolerance. The tolerance situation can be influenced by changing the coiling tension. Due to the casting method and because of the capillary effect, good bonding with the steel cord tesnion members. High image quality of the cast polyurethane. Fine contours can be moulded exactly. Especially suitable for small pitches. DL meshing and profile flights on the back of the belt can be moulded at the same time. The de-moulding timing belt coil has a mould-related overall useful width of up to 300mm. Belt lengths from 55 to 6000mm endless length. Synchroflex Polyurethane Timing Belts are used in all technical fields where synchronous transmission of a rotary movement is required. Independent, whether power transmission, servo control functions or switching and conveying tasks are required. They operate in a rotational speed rang of up to 20,000rpm.